For the soup base, boil miso water and green onion and add in gelatin, stirring till fully dissolved. Keep on low simmer until the filling is ready. You can season with a bit more miso to taste or add in a bit of honey for sweetness. In a medium sized bowl, mix together pork, soy and vinegar. Dice and sauté button mushrooms in a medium fry pan until they release most of their moisture then stir in soy and vinegar. In plastic ice cube trays, portion about 4-5 grams of each filling until all used up. You should get about 20 pork and 20 mushroom “icecubes”. Ladle the hot soup mixture in the trays. Make sure to not over fill because you will want to easily be able to separate the gelatin cubes. There should be about a 50/50 ratio of soup to filling. Place the trays in the fridge until the soup turns to gelatin, about 1 hour to 1 hour and 30 minutes. Meanwhile boil your water for the dumpling wrappers. In a mixer or by hand in a bowl, add in flour, tapioca starch and oil. Pour in your boiling water and mix until the ingredients are combined. In an electric stand mixer or by hand, knead the dough for 10 minutes or more until it becomes smooth and elastic. Cover with a damp cloth and let rest for at least 30 minutes. When your soup gelatin cubes are set, begin to roll out the dough. 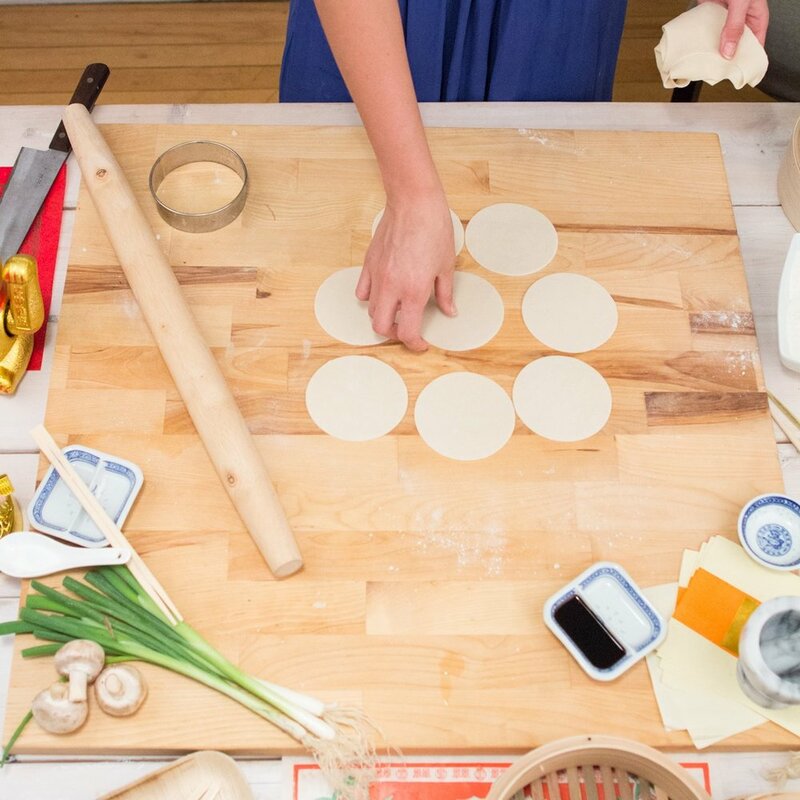 Start by dividing your dough in 4 and use a rolling pin to roll out each piece until about 2 millimeters thick. Use flour as needed to prevent sticking. Using a ring cutter about 11 inches in circumference cut the dough into circles. Pat with a little flour and roll out each circle again to increase the size. Be careful not to roll too thin as this may break the dough. 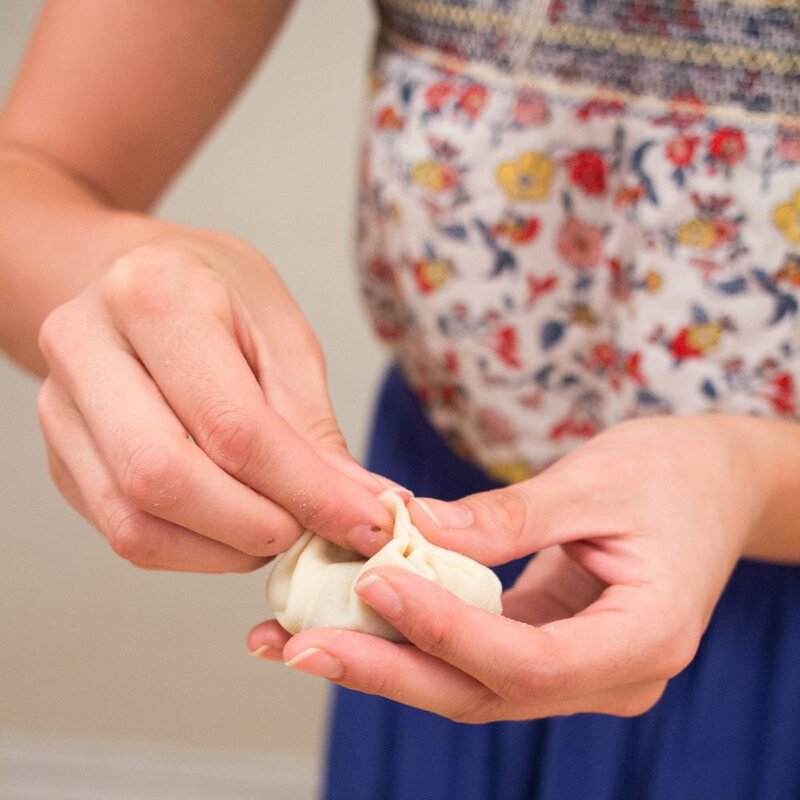 Using a small spoon, scoop out one of the gelatin cubes and place in the center of a dumpling round. Using a very small amount of water, dampen the circumference of the wrapper while holding it your hand to cup it slightly. Crimp the edges and bring them together in the center to seal. Repeat the process with all gelatin cubes until finished.